Let’s look at some typical Maryland deck issues, and how to solve them. No matter time of year it is, you can expect Maryland weather to be unexpected. What havoc will Mother Nature wreak on your deck this year? As the summer turns into fall, you should pay extra attention to your deck. Let’s look at some typical Maryland deck issues, and how to solve them. As we’ve discussed previously, your deck is prone to rotting. Whether it’s dry rot or wet rot, your deck will begin to decay. A rotting deck isn’t just unsightly; it can present a danger to you and your party guests: instability. When a deck is rotting, it is far less stable than it should be. Since handrails and stairs are the trickiest parts of a deck to seal properly, they’re more likely to rot than other parts of your deck. How can you solve this problem? Use deck sealant. However, even though deck sealant can prevent future harm, it can’t undo any damage that has already occurred. If that’s the case, you might have no other option but to replace the entire deck. Even though the weather is cooling off, bugs have yet to retreat for the winter. Your Maryland deck will never be fully protected from the effects of bug attacks. After all, these intruders can infiltrate the wood of your deck, and turn it into a new home. Because many of these bugs, such as termites, delight in devouring wood, their presence will weaken the integrity of your deck. They need to be dealt with, forcefully. Your solution? Call on the exterminators. They can eliminate any pests for you, and help you to prevent their return. For full protection, add a layer of protecting coating and sealant. Mold and mildew are common household problems. What can cause the development of mold and mildew? Blame it on poor deck ventilation, moisture damage from constant rainstorms or humidity, and neglected cleaning. Besides affecting your health, and that of your loved ones, mold can also cause your deck to turn gray or start splintering. Solutions-wise, clean up your deck and make sure all water drains away properly. 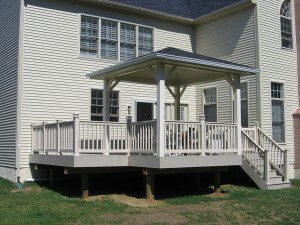 Call on a trusted Maryland deck expert to help you decide if you should replace your deck.